After Mitt Romney’s remark about de-funding PBS during the first presidential debate launched several “fired Big Bird” Twitter accounts, his “binders full of women” comment at Tuesday night’s town hall debate spawned an even larger national phenomenon. And -- and so we -- we took a concerted effort to go out and find women who had backgrounds that could be qualified to become members of our cabinet. I went to a number of women’s groups and said, “Can you help us find folks,” and they brought us whole binders full of women. 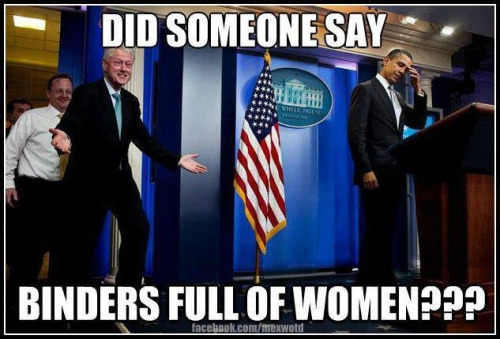 Before the debate had even ended, bindersfullofwomen.tumblr.com was making its way around social media, complemented by a Facebook page and the #bindersfullofwomen hashtag on Twitter. The line caught so many people’s attention in part because it sounded so dismissive and clumsy. Knowing Romney’s track record of handling women’s issues, it’s easy to imagine him reducing his roster of talented female job candidates to a list of names in a generic three-ring binder. Over the next hours and days, new elements of the story came to light. 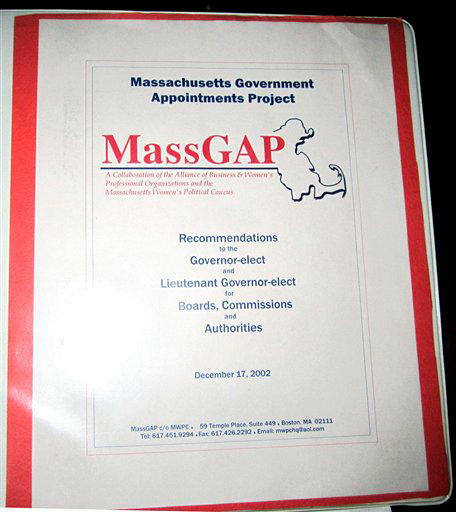 For one thing, we learned that Romney had not actually asked for a list of potential female hires; rather, a group called MassGAP had created the “binder” (you can see the real thing here) on its own accord and pushed Romney to take a look. And it turns out that the women he actually hired for senior positions, from the binder or elsewhere, were mostly Romney campaign donors. Adding extra poignancy to the story, we also learned that the creator of the Binders Tumblr is a 23-year-old woman from Brooklyn who had been laid off just hours before the debate. 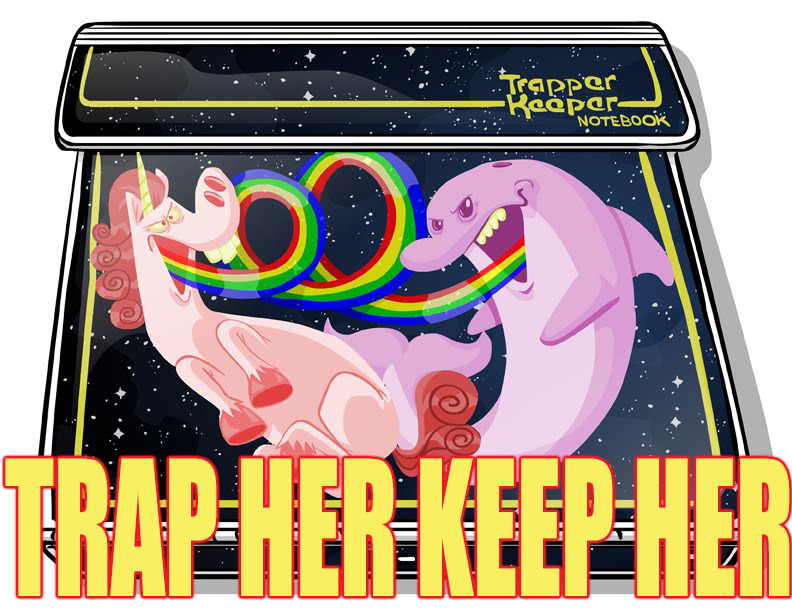 The meme, and the conversation surrounding it, continues to grow. 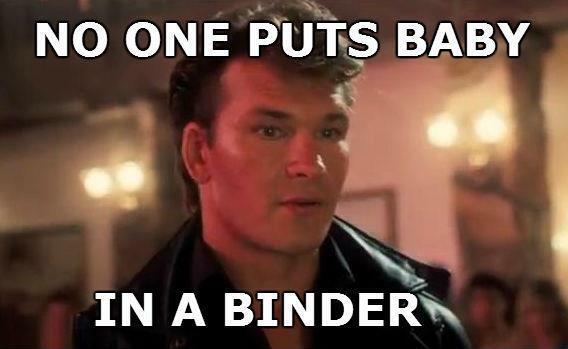 Below are several of the most hilarious and astute pictures, videos, and thoughts to come out of two days full of binder-talk. ...I’m laughing along with everyone else who’s scrolling through images of Ryan Gosling promising, “Hey girl, I won’t put you in a binder.” The thing is, I want to be put in a binder. (And, cough, not just by Ryan Gosling.) I want the top-level men in my profession to be thinking about recruiting people who don’t look like them and share their background. Making concrete lists of qualified applicants who haven’t rubbed elbows with the boss at a cocktail party is a great way to seek out qualified, diverse recruits for top-level jobs in a variety of industries. That is, if the recruiters are interested. I was more struck by the fact that he answered a question about pay equity with a story about diversity hiring. If we had the language as a society to describe this difference, the jokes might have been more pointed. Diversity is about variety, getting bodies with different genders and colors into the room. Equity is about how those bodies get in the door and what they are able to do in their posts. 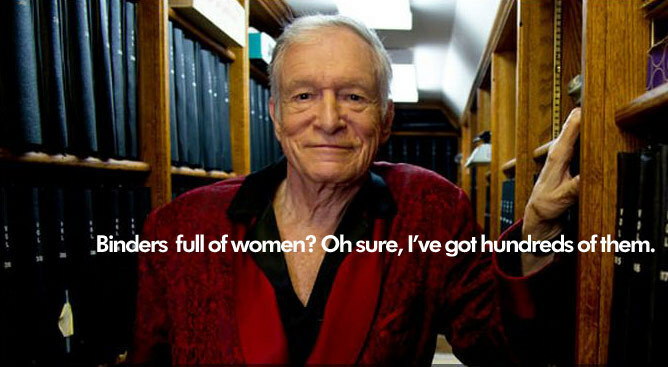 A diversity approach has gotten us to the point where Romney could get a binder full of women’s resumés. (Though, notably, the real credit goes to the group MassGAP, which pushed the governor’s office to hire more women in high-level posts.) An equity approach is what would have forced him to address the pay gap, which I bet all the women in those binders have experienced. 7. The Women’s Media Center chimes in to remind everyone that it has a metaphorical “binder” filled with hundreds of qualified women experts on its website.